If you’re new to Adobe’s PhotoShop program, it can be overwhelming to figure out all the fabulous bells & whistles it offers. However, it’s a wonderful tool for artistamps! When I wrote this article around 2002, I was using Adobe 5.0. The commands may vary slightly if you’re using a different version, but the concepts remain the same. 2. Go into the Edit menu, select Define and then Define Pattern. (Some programs go directly to Define Pattern.) Your image is now saved in Adobe’s short-term memory. 3. Delete your original image, by clicking on the X on the image window, or you can just delete the layer with the image by using Layer–>Delete Layer. 4. Either enlarge that emply window/layer (if you merely deleted the layer) so the Image Size is slightly smaller than the paper you’ll be printing on –OR– (if you clicked on the X and removed the entire image) create a new image (File–>New) in that size. I like to work with an image that’s about 7″ x 10″ for paper that’s 8.5″ x 11″. 5. Select the entire image/layer. You can do this by hitting Control-A, or by right clicking and choosing Select All. 6. Right click inside the new image/layer, select Fill and then choose Pattern. Your image, repeated to fill the new size, will appear. If you are happy with what you see, you’re ready to print. 7. If your new, repeated image isn’t tidy–and it usually isn’t–you’ll want to remove (crop) the partial images. Use your Select Area tool to surround all of the complete images. Then choose Image and Crop so the loose pieces vanish. Now you’re ready to print. 8. If you’re using nice (price-y) paper for your finished product, it’s a good idea to print a “proof” copy on plain (cheap) paper, to make certain the finished plate of stamps looks pleasing. If positioning is key, you may want to print on tracing vellum first, lay it over the paper you’ll be using for the finished product, and see if it lines up okay. 9. After you’ve printed your stamps and are ready to close your Adobe program, save just ONE copy of the stamp image, using the Crop feature. You can save the entire repeated image if you like, but that can take up a lot of disk space if your hard drive is nearly full. These are a few stamps from my own collection of inexpensive, international postage stamps. They are “real” stamps, used on mail. I like them because they look exotic and/or old, and I gather ideas from them. I’m providing them as inspiration. You can copy* them, tweak them with your own color and design ideas, or… well, you decide! Want to see more cool and unusual stamps? I recommend The Mystery Box, a philatelists’ site. *No stamps at this site — “real” or artistamps — should be copied or used illegally. If you’re sending your artistamps for others to use, you probably want to make them as much like “real” postage as possible. For example, you’ll want the recipient to be able to lick the back of the stamp so the glue becomes moist and will hold the stamp in place. The following information was provided by members of the AML artistamp list. These are your three most popular options for glues and adhesives, if you’re creating artistamps. (1) Buy paper with an adhesive (water reactivated) backing. Another resource might be a small quantity supplier of paper. Some of them are “green” paper companies. You can get more information at Conservatree.com. If this sounds too complicated, you can have someone professionally print your artistamps on pre-gummed perforated paper. 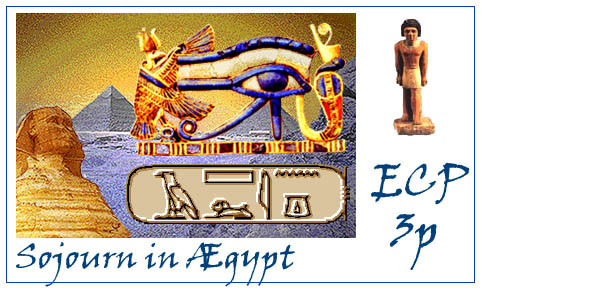 WCP-NM (Olathe Poste) is another excellent online resource. (2) Apply lickable (water reactivated) glue. The glue stuff itself can be purchased and applied to any paper. One kind of glue stuff is Neutral pH Adhesive, by Lineco. You’re looking for it as product number 901-1008. It’s carried by larger camera supply shops, as photographers use this to mount photos, etc. You can also find this Neutral pH Adhesive by Lineco, at MisterArt. 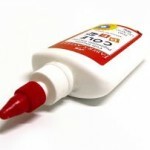 Another glue stuff–that I use–is Lick & Stick. It comes in a bottle that looks like a roll-on deodorant, but it has a sponge on the top of it. I sort of paint it on the paper, and it dries. Most curling that occurs when it’s wet, flattens out as the glue dries. The glue is clear and tasteless. You can order Lick & Stick at directly from the manufacturer, Greensneakers. They offer templates for other paper products, too. (3) Make your own water reactivated glue. See my article, Glue Recipes – Artistamps for a variety of homemade glues that you can mix and apply to your stamps. Glue recipes vary from great to disastrous. But, they can be a fine alternative to “lickable” adhesive-backed paper and commercially prepared glues, described in my article, Glues and adhesives for artistamps. Climate differences can affect how well a glue recipe works. Likewise, personal taste–sometimes literally–can influence your choices. Artistamp genius Jas kindly sent this recipe for stamp glue, as developed by Bugpost. 3. Add corn syrup & lemon extract, mix well. 3. Mixture can be stored in an airtight container in the refrigerator, for a very small amount of time. You may need to reheat it if it’s too gummy and thick. Note: The lemon extract repels bugs which like to munch on starches (such as gelatin and corn syrup), but you could probably use other flavoring extracts from the baking supplies aisle of the grocery store. Artistamp collectors in tropical countries may choose to store stamps in plastic. Also, before using another flavor, remember that many people have life-threatening allergies and react badly to anything with peanuts in them. Since this may include almond flavoring, and perhaps others, humor your tastebuds carefully! Boil vinegar in small pan. Add gelatin and stir until dissolved. Add flavoring and remove from heat. Use brush to spread on envelope flaps. Let dry. Moisten to seal. When leftover glue cools, it will set. It may be reused again and again if you take a little caution when storing it. Place it in a small HEAT PROOF container and you can shoot it with your heat gun to remelt it. Or you can place the small glass jar into a pan of water and heat it that way. Just take caution not to break your glass containers when reheating the glue. Coat let dry and coat again. This taste awful so use a sponge not your tongue when wetting to seal. 18 T (that’s about a cup and a bit) vinegar-bring to a boil; add 1 pkg Jello in whatever flavor; stir til dissolved; let cool; keep in the refrigerator between uses. Brush on and let dry. 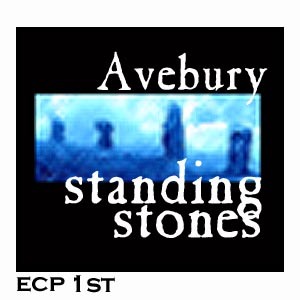 that one is from Coffee Break Design. I’m not too sure on this one; someone will correct me I’m sure: 1T each vinegar and white glue; drop or two of peppermint flavoring. Those recipes were all kindly provided by members of the AML (Artistamps) list at Yahoo!Groups. If you spot errors, missing links, or if you have yet another recipe, please let me know with the contact form, above, or leave your glue recipe as a comment. 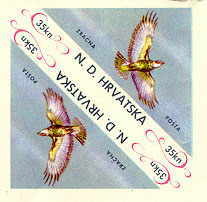 I’ve been making artistamps since around 1978. My first stamps were handmade, one by one, and sent with my zines of that era. I hand-carved a border that looked like a perforated stamp edge, and stamped it repeatedly to create the ‘frame’ of each stamp. Then, I put art in the middle. I don’t have copies of any of them. If they brought people joy, they served their purpose. 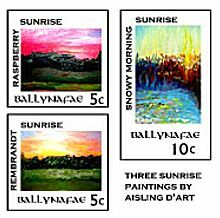 This block of stamps features some of my sunrise paintings. 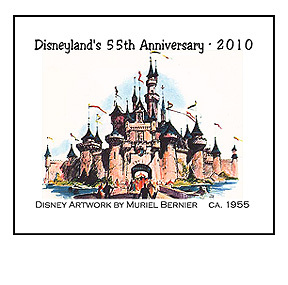 This block of six stamps includes photos of Disney’s EPCOT parade, Tapestry. 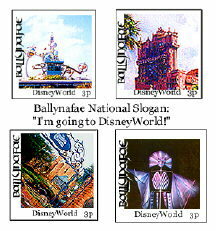 The puppeteers include Disney cast member Jeremy Pace (in the lower left stamp). The link opens a PDF version of the stamps. This series features photos from Disney World. This set is not available in printable size. 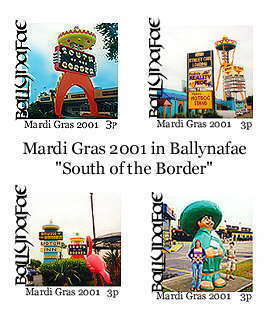 Also not available in printable size, this series includes photos from the popular tourist attraction, ‘South of the Border’. 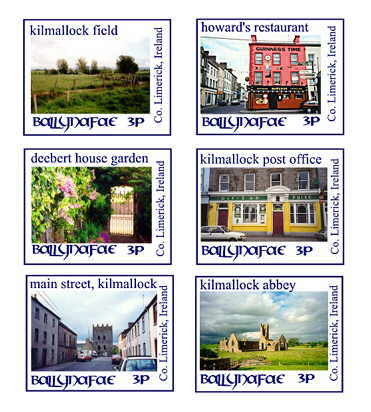 Kilmallock is south of Limerick, Ireland, and it’s one of my favorite towns in Ireland. Many of my ancestors came from this area.